Before becoming a chef, Chatsuda, affectionately known as ‘Ko’, was a journalist for the well-known Thai TV channel for over 15 years. During that time, she travelled across the country and experienced authentic Thai cuisine at some of the best fine dining restaurants and rustic rural villages. Through her travels across Thailand, Ko fell in love with the distinct flavours and spices of the food of each province. Inspired to learn how to re-create these culinary wonders, Ko studied Professional Thai cooking and Thai restaurant management at Kasetsart University. Later, she completed Thailand’s top Five-Star hotel cooking program at The Mandarin Oriental Hotel. In 2011, Ko immigrated to Toronto with her Canadian husband, Donald. Since then, she's brought her authentic Thai cuisine, and peaceful, warm spirit to some of the best restaurants in the city. 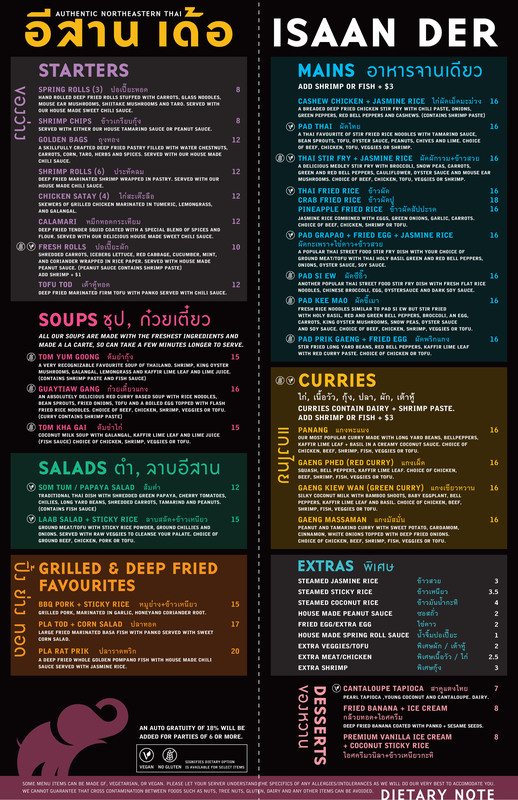 Now Chef Ko brings Northeastern Thai cuisine, characterized by its distinct fiery spiciness, to Isaan Der.